OSAKA - The opening last March of the Hokuriku Shinkansen Line extension to Kanazawa, Ishikawa Prefecture, brought the Hokuriku region closer to Nagano and Tokyo than ever before, and similar efforts are underway to connect the region with Kansai. But with the line’s extension from Kanazawa southwest to Tsuruga, Fukui Prefecture, expected to be completed by the end of fiscal 2022, where to build the final link from Tsuruga to Shin-Osaka Station in Osaka is rapidly becoming the hottest political topic in the Hokuriku and Kansai regions, one with far-reaching national implications that could even affect the outcome of this summer’s Upper House election. 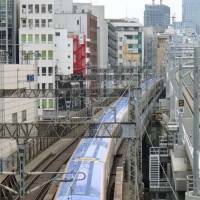 Once the Hokuriku Shinkansen Line is extended to Tsuruga, the route for the final link to Shin Osaka will have to be decided. At the moment, there are four basic plans on paper, including three that have already received extensive local and national discussion, plus a fifth pushed by a local politician. 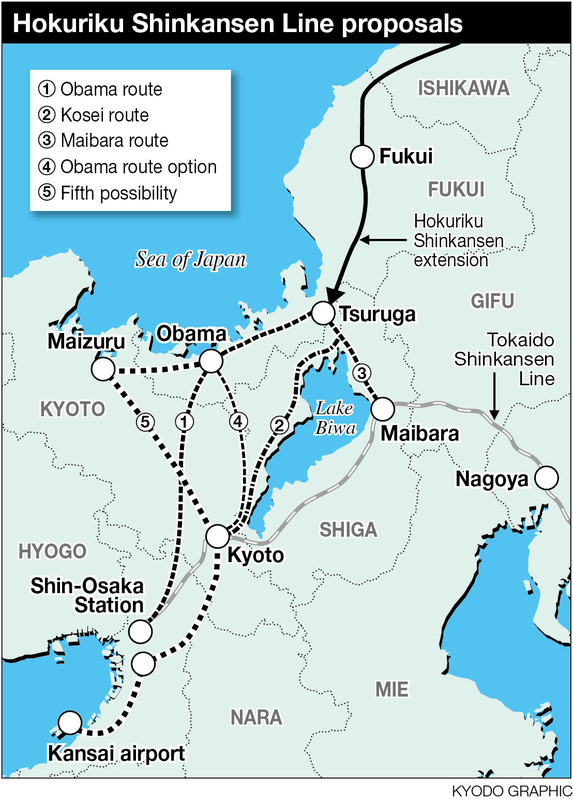 Plan 1: Known as the Obama route (see chart), this plan would see the Hokuriku line run down through Fukui to the town of Obama. Plan 2: The Kosei, or Western Lake, route proposes sending the line down the western side of Lake Biwa to Kyoto, where it would join the already existing Tokaido Shinkansen Line connecting Tokyo with Osaka. Plan 3: The Maibara route, on the other hand, proposes taking the new line southeast through Shiga Prefecture to Maibara, which again would allow passengers to transfer to the Tokaido line. Plan 4: Still being informally discussed by West Japan Railway Co. (JR West), this one would run the line through Kyoto, between the Obama and Kosei routes. Finally, a local Kyoto politician has suggested a fifth route that would extend the Hokuriku line to Maizuru, Kyoto Prefecture, where it would bend south and head to the city of Kyoto, maximizing any benefits. Time-wise, the Obama route would take 33 minutes, the Kosei route 35 minutes, and the Maibara route about 45 minutes to make the run from Tsuruga to Shin-Osaka Station. The exact times for Plan 4 and the most recently proposed route have not been officially calculated. 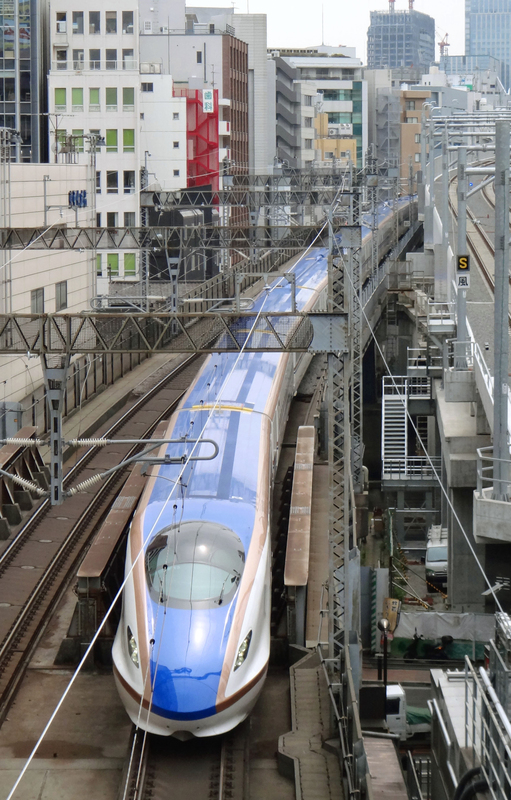 With so many potential economic and political benefits at stake, the Hokuriku shinkansen sweepstakes is pitting Kansai’s governors against each other. On Nov. 19, Hyogo Gov. Toshizo Ido, in his role as head of the Union of Kansai Governments, a loose federation of eight prefectures and the four big cities of Kyoto, Kobe, Osaka and Sakai, Osaka Prefecture, said regional leaders might be willing to support an alternative to the Maibara route. “The final decision (on the route) should be one that fits the present, not one that is bound by past decisions,” Ido said. The Maibara route is particularly unpopular in Kyoto, which it would bypass, but is heavily supported in Shiga, where Gov. Taizo Mikazuki has raised doubts about all of the other proposals. “If you think about what benefits the region and the country most, especially in terms of cost, the Maibara route is the best. The Union of Kansai Governments also decided on this route,” Mikazuki said. But in Fukui, Gov. Issei Nishikawa is naturally pushing hard for the Obama route. Obama also happens to be close to the Fukui towns of Oi, Takahama and Mihama, where Kansai Electric Power Co.’s 11 nuclear reactors are situated. “We want to see a decision this year on the Obama route. For Fukui, it’s extremely important,” Nishikawa said. It is Fukui’s preferences that could heavily influence the final decision. Liberal Democratic Party policy chief Tomomi Inada, a favorite of Prime Minister Shinzo Abe, chairs the ruling party committee that will decide the issue. She also happens to represent Fukui. In addition, Fukui’s nuclear power plants, and local political support for them, have long been used as a bargaining chip in negotiations with the central government and the Kansai region, which relied on atomic power for nearly half its electricity before the March 11, 2011, earthquake and tsunami that sent the Fukushima No. 1 plant into a triple meltdown. In December 2003, the Fukui Prefectural Assembly passed a resolution warning the central government that if it didn’t come up with the funds to build the Hokuriku Shinkansen Line within Fukui, it would create problems. “Unless such construction takes place, we’re ready to oppose the policy of national government support for nuclear power,” the resolution read. The following year, the government, anxious to avoid problems with Fukui, formally agreed to extend the route to Fukui. Yet there are numerous practical problems with the Obama route. Of the four major proposals, it’s the one that costs the most and serves the least number of passengers. The Union of Kansai Governments estimates that building the 123-km Tsuruga-Osaka route via Obama would cost ¥950 billion and draw an average of 26,000 daily riders. The other three plans, the union projects, are all cheaper and will serve more passengers. The projected cost of plan 2, the 81-km Kosei route to Kyoto (where passengers would transfer to regular trains to Osaka) is ¥770 billion, with 31,000 daily riders. But this route is less favored politically, partially due to existing rapid train service between Tsuruga and Kyoto. Plan 3, the 44-km Maibara route, was the one recommended by the union of Kansai Governments back in 2013 and is supported by Shiga, and even Ishikawa, due to the fact that it’s the cheapest (¥510 billion) and would serve 33,000 people a day (though transfer to the Tokaido Shinkansen Line would still be required). 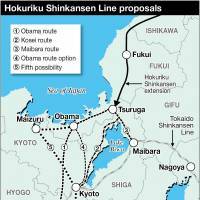 Finally, the fifth, albeit vague, proposal, by Shoji Nishida, a far-right LDP Upper House member from Kyoto and friend of Inada, would extend the line down through Obama and jump the Fukui-Kyoto border to the port of Maizuru, where it would stop before curving south to Kyoto, and then Osaka. 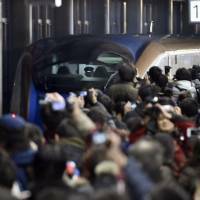 “Right now it takes six hours to reach Tokyo from the area near Maizuru. To achieve the government’s local revitalization plans, you should start with the country’s most inconveniently located areas. In addition, with the nuclear power plants close by and the presence of a Maritime Self-Defense Force base in Maizuru, the government has an obligation to protect (economically) these nationally important areas,” Nishida said on his blog last month. There is also much support for this idea in Kyoto Prefecture. Inada’s committee will spend this year reviewing the various proposals but will no doubt exercise caution on an issue that could rile their Hokuriku and Kansai-based candidates in this summer’s Upper House election. And at least one governor in the area is worried the ruling parties will play politics over the issue. “It doesn’t matter what the route is. 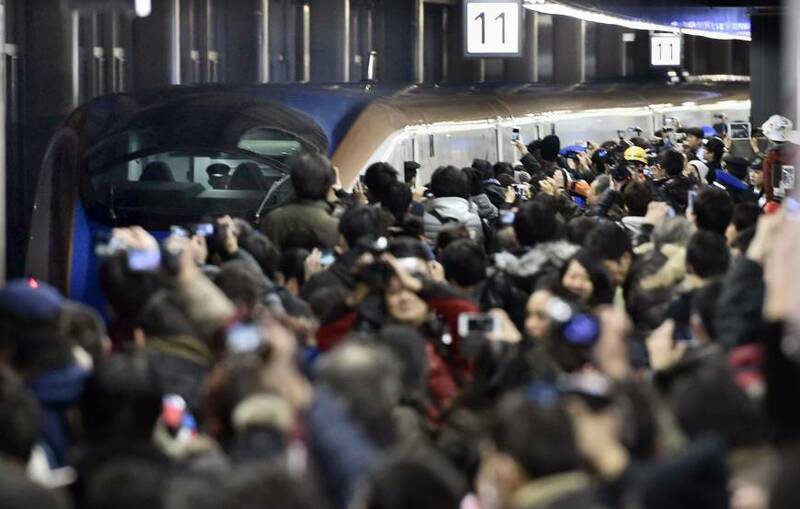 What’s important is that a decision be made quickly,” said Osaka Gov. Ichiro Matsui, who sits where the Hokuriku Shinkansen Line will terminate regardless of the geographical, and thus political, routes it uses to get there.